« 3-Page Previews: HARBINGER WARS #1! Viewers of the chilling Indie Comics Horror #2 Video Preview at http://indiecomicsmagazine.com/ receive more than scenes of terror from the new horror comic. Follow the link at the end of the video preview and Star Destroyer will give you their entire digital album “Millennials,” free. Nine complete tales of dread, three more than Indie Comics Magazine #1, shamble through Indie Comics Horror #2, the best fear from independent comic book creators. “Like some cancerous growth, this publication keeps growing!” laughed Beatty. With no huge overprint, no digital version and no back issue sales, Indie Comics Horror #2 is available ONLY at your local and online comic book shops. 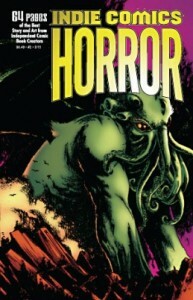 It is best to pre-order from April 2013′s Previews comic book catalog, said Beatty. Enjoy the Indie Comics Horror #2 Video Preview and discover Star Destroyer at http://indiecomicsmagazine.com/ While you’re there, accompany Beatty into darkness — join the Aazurn Publishing Email List. 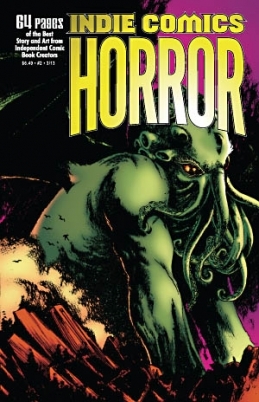 This entry was posted in Columns and tagged Aazurn Publishing, alternative comics, creator owned comics, gary scott beatty, horror comics, indie comics horror, indie comics magazine, star destroyer. Bookmark the permalink. Follow any comments here with the RSS feed for this post. Post a comment or leave a trackback: Trackback URL.